Medical aesthetics leader will soon offer breakthrough photodynamic cosmetics product. We stand true to our commitment in providing the highest levels of safety and product efficacy, along with the most innovative technology in the market. 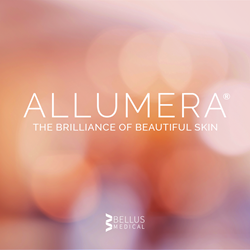 Bellus Medical, a leader in medical aesthetics, recently acquired Allumera®, a breakthrough topical cream that’s the first in a new class of photodynamic cosmetics (PDC). Allumera® is the first PDC cream specifically formulated to improve the overall appearance of skin, visibly reduce outward signs of aging, and minimize the appearance of pores – all with minimal downtime and results that last. It’s applied by a healthcare professional and activated by a wide variety of light sources that include Red, Blue, IPL and PDL. Bellus Medical acquired Allumera® from Photocure, the world leader in photodynamic technology. It’s a great solution for customers with visible signs of aging who seek a non-invasive, in-office treatment that will improve their skin without obvious or unwanted side effects. Bellus Medical anticipates to launch Allumera in Q4 2017, making this the third product addition and successful business development transaction this year. Bellus Medical, headquartered in Addison, Texas, is an industry leader in medical aesthetics with a solid reputation of providing the highest levels of safety and product efficacy, along with the most innovative technology on the market. Bellus Medical was founded in 2012 and quickly became a pioneer in the medical microneedling industry with the introduction of their flagship product SkinPen®, a state-of-the-art microneedling device. The product portfolio continues to expand with differentiated products that enhance the patient experience and represent a significant business opportunity for medical practices. Built upon three core principles: customer service, technology and education, Bellus is much more than a supplier to aesthetic practices. It is a trusted business partner. To learn more about Bellus Medical, visit http://www.BellusMedical.com.